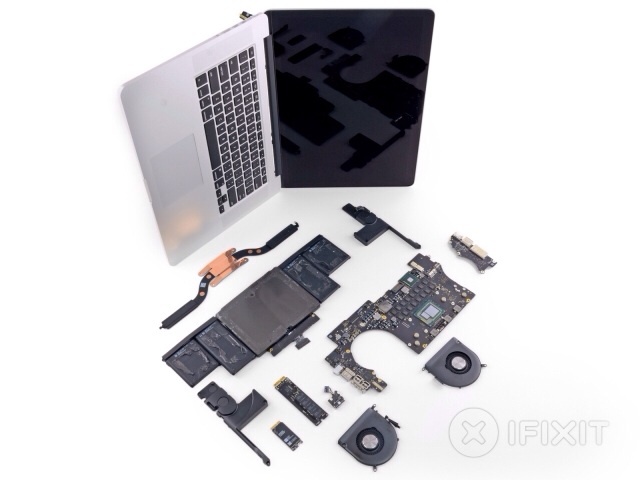 iFixit has performed its teardown of the new 13-inch and 15-inch Retina Display MacBook Pros. Unfortunately, both notebooks score a 1 our of 10 for ease of repairability. ● Proprietary pentalobe screws continue to make opening the device unnecessarily difficult. ● The battery assembly is now entirely, and very solidly, glued into the case, thus complicating replacement. Additionally, the battery now covers the screws and cable holding the trackpad in place. It is impossible to replace the trackpad without first removing the battery. ● The Retina display is a fused unit with no protective glass. If anything ever fails inside the display, the entire ($$$) assembly will need to be replaced. ● The RAM is soldered to the logic board, following the lead of the MacBook Air. Pay for the upgrade now, or be stuck with 4 GB forever. There is no chance of upgrade. ● The proprietary SSD is now in a PCIe format, but still isn't a standard drive. Cross your fingers for future compatible drives; for now, you're stuck with what you've got. ● Proprietary pentalobe screws prevent you from gaining access to anything inside. 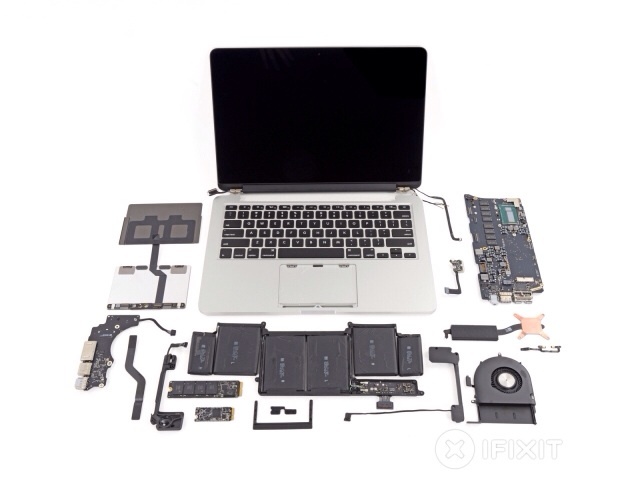 ● As in the MacBook Air, the RAM is soldered to the logic board. Max out at 16GB now, or forever hold your peace—you can't upgrade. ● The proprietary SSD has changed to a PCIe format, but still isn't a standard 2.5" drive. However, it is a separate daughtercard, and we’re hopeful we can offer an upgrade in the near future. ● The lithium-polymer battery is glued rather than screwed into the case, which increases the chances that it'll break during disassembly. The battery also covers the trackpad cable, which tremendously increases the chance that the user will shear the cable in the battery removal process. ● The display assembly is completely fused, and there’s no glass protecting it. If anything ever fails inside the display, you will need to replace the entire, extremely expensive assembly. We would recommend AppleCare for the new MacBook Pro retina.